제가 여태까지 제 혈액형 모르고 살았는데 처음으로 알게 됐어요 이번에...30년동안 모르고 살았어요!!! 원래 미국에서 어릴 때부터 혈액형 알려주지 않더라고요..한국 와서 사람들 만날 물어보니까 드디어 혈액형 검사받았어요. 그리고 나라별 혈액형 문화도 알아봤어요. 여러분한테 유익한 영상 됐으면 좋겠어요! 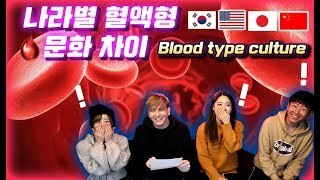 재미있게 봐주세요 ^^ So I pretty much lived 30 years without knowing my blood type. Honestly, it's not something we put a lot of importance in when living in the US..but Korea is HEAVY on blood types. They divide blood types into different personality catagories as well. I hope you find this video fun and useful. Enjoy!